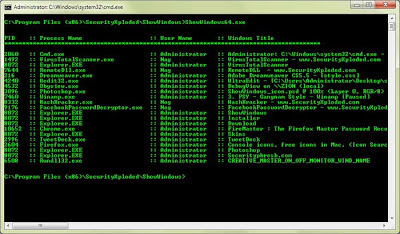 Show Windows is the command-line tool to manage Windows opened by all running Processes on your system. 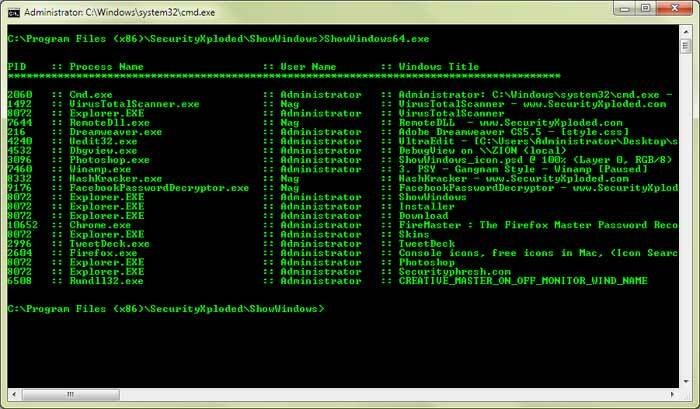 In Penetration Testing environment, it can help you to discover all kind of activities happening on the target system. Instead of just plain listing of running processes, open Windows list can reveal more interesting details. For example, Files currently opened by the user, what songs/videos being played, what websites being watched etc. 'Show Windows' is available in both 32 bit & 64 bit versions. It works on all Windows Platforms starting from Windows XP to latest version, Windows 8.